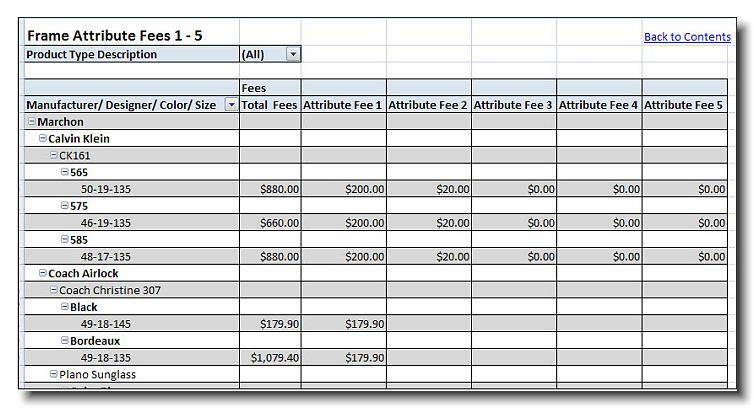 For Frames, Ready Readers and/or Plano Sunglasses, these reports give you a detailed listing of the Attribute Fees, Attribute Costs, CPT codes, financial and production groups and all other data added to the product tab. This report can also be used to find products without codes, production and financial groups, fees, etc. Worksheet 1 includes all Frame Names grouped by Manufacturer with color and size and Attribute Costs. Use the Product Type Description and Manufacturer filters to reduce the size of the report to only get frames by Manufacturer. Worksheet 2 includes all Frame Names grouped by Manufacturer with color and size and Attribute Fees. Use the Product Type Description and Manufacturer filters to reduce the size of the report to only get frames by Manufacturer. Worksheet 3 includes all Frame Names grouped by Manufacturer with Financial and Production Groups, Frames Data Costs, Assigned CPT Code. Use the Product Type Description and Manufacturer filters to reduce the size of the report to only get frames by Manufacturer. Use the Production and Financial Group Filters to find products without groups.